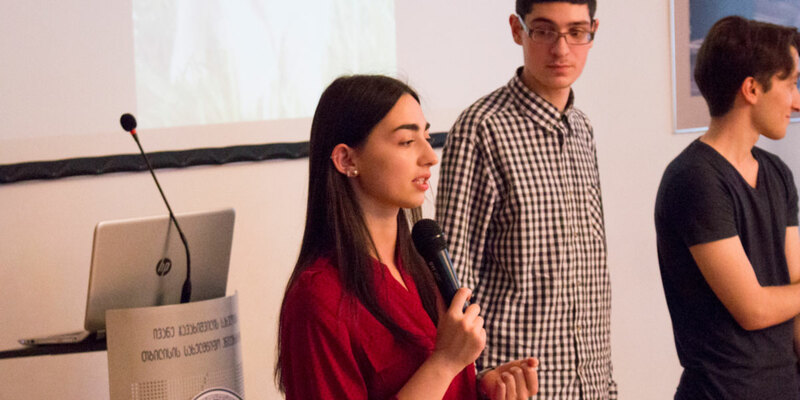 Through an innovative partnership with San Diego State University (SDSU), the Millennium Challenge Corporation's (MCC) Georgia Compact is shaping the next generation of Georgian and U.S. science, technology, engineering and math (STEM) leaders. The compact offers the opportunity for Georgia’s best and brightest young adults to pursue U.S. bachelor’s degrees in subjects such as chemistry and computer engineering without leaving their home country, positioning them to enter the workforce with the skills needed to make Georgia, a key U.S. strategic partner in the region, a more prosperous and stable country. An exchange program allows U.S. students to study abroad in Tbilisi, Georgia’s capital, and Georgian students to study abroad at SDSU’s main campus in California, affording them an opportunity to gain important global experience. Since welcoming its first class of freshmen in 2015, SDSU-Georgia has seen enrollment grow exponentially every year. Nearly 400 students are currently enrolled, with 85 percent coming from low-income households. MCC’s investments also encourage women’s participation in STEM; about one-third of students are women. Recognizing the potential contributions of highly qualified STEM professionals to their businesses in Georgia, private sector donors have contributed over $3 million for student scholarships. SDSU partners with three public Georgian universities -- Tbilisi State University, Ilia State University and Georgian Technical University -- to support delivery of U.S. curricula. From modernization of classrooms and state-of-the-art laboratories to instructor training, MCC’s investments enable partner universities’ degree programs to gain international accreditation and certification, ensuring that Georgian students can continue to access high-quality STEM degrees for years to come. In this interview, three juniors who have participated in the exchange program talk about how MCC’s investments have opened up educational and professional opportunities for them. Ani Shalamberidze is a Chemistry Major at San Diego State University-Georgia who studied abroad in San Diego. In the 11th grade, I spent a year as an exchange student in Troy, Illinois, as part of the U.S. Department of State’s Future Leaders Exchange Program. During our first chemistry class, the teacher demonstrated a fun experiment converting colors. I liked it so much that I decided that I wanted to major in chemistry. When I came back to Georgia and heard there was going to be a U.S. university with brand new labs and the opportunity to collaborate with Georgian and American professors, I knew that was my best chance to do the sort of laboratory work I wanted to do. The SDSU-Georgia program and the scholarship I won were lifesavers for me. During my time as an exchange student in San Diego, our professors got me and the other Georgian students involved in undergraduate research. We worked with American graduate students who taught us how to conduct different chemistry experiments using the latest equipment. We are taking everything we learned in the United States back to Georgia to continue this research and help provide this great experience for other chemistry students. I have been active in getting more young people in Georgia involved in STEM. I am working on a STEM Georgian-language cookbook for kids that explains the scientific aspects of daily cooking processes like baking bread. I plan to go on to graduate school and get a Ph.D. I enjoy lab work, so I would like to be involved in research and make a discovery one day. In the long term, I hope to establish my own company. With this program, you get the chance to learn in your own country and get the same opportunities and valued knowledge as you would get abroad. More Georgians will have the opportunity to be competitive for STEM jobs and to be successful in their own country. I think that there is a bright future for all the STEM majors in this new generation of Georgians. Taylor Inouye is a Chemistry Major at San Diego State University who studied abroad in Tbilisi. As a chemistry student in an American university, studying abroad tends to set you back because the courses don’t transfer. The exchange with SDSU-Georgia enabled me to take classes that counted toward my major. We performed the same experiments that my classmates did on the main campus in San Diego, and we also were held to the same grading standards. With this exchange, I will not only be able to keep my graduation date but make it a little earlier because I got ahead when I was in Georgia. I got to know my professors at SDSU-Georgia, which is a small, close-knit campus. My professors really cared about my development as a student, and I felt like I could succeed because I had people motivating me. Studying in Georgia has given me a lot of practice learning about different cultures and how to interact with them. The value of the exchange was more than I could ever ask for. Right now, I am thinking of going to graduate school in the Netherlands. My dream is to have a job that I love, probably in the personal care chemistry field developing cosmetics, soaps and other products. SDSU-Georgia brought together the brightest minds of Georgia. These students will go on to work in the STEM fields and promote Georgia’s economic growth. And because this program has offered all the opportunities that it did, including the connection to the United States, it really strengthens the already strong bonds between our two countries. 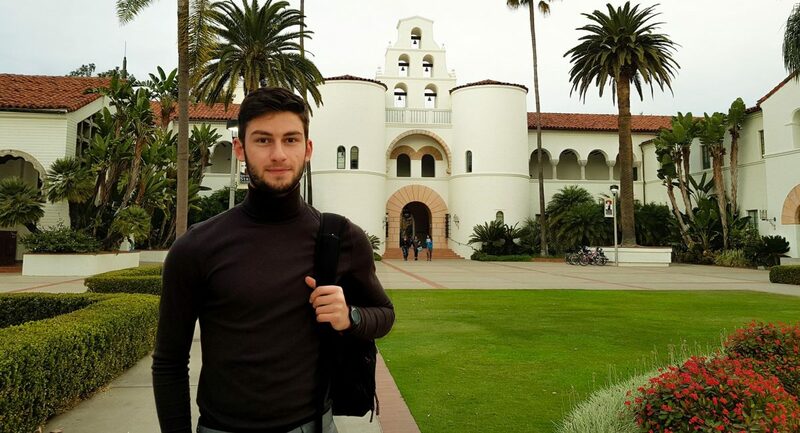 Luka Lomtadze is a Computer Engineering Major at San Diego State University-Georgia who studied abroad in San Diego. I started programming in fifth grade. In part because of my family’s financial background, I started working when I was 16. I worked creating software solutions, including mobile applications, for different companies, making business much easier for them. In high school, I competed in national informatics and physics competitions and represented Georgia internationally. Now, I take part in hackathons, which are competitions where you get 48 or 72 hours to develop a software system. One of my hackathon inventions is a mobile application called Hero. It helps people in Georgia become blood donors, or heroes, and those in need to find donors who match their blood type. With the SDSU-Georgia program, I saw an opportunity to get a U.S. degree in my country, which is still developing, especially in the STEM field. The United States has a well-developed STEM field and a more open education system that gives students more freedom to pursue different opportunities. I am a junior student, but I am taking graduate-level classes in computer science at SDSU during my year abroad in San Diego. The exchange and learning from American professors is one of the best parts of the program. Being in the United States also opened new professional opportunities for me. This summer, I will intern at Facebook’s headquarters in Menlo Park, focusing on software development. A U.S. diploma is one the most powerful things to have in Georgia when you look for a job. Eventually, I think I will transition from the information technology field and go into business or politics in Georgia. I want to become one of the people who will come up with new innovations to help Georgia develop and become one of the future leaders of my country. About the Authors: Brittany Grabel and Michelle Cigarruista both serve as Program Officers for Georgia at the Millennium Challenge Corporation (MCC). Editor's Note: This entry originally appeard on the MCC's blog.